Caroline Pidgeon AM (Lib Dem) Chair of the Transport Committee has been asking some probing questions of the Mayor and TfL about the deadly junctions in Kings Cross following work by this website when I went out with a surveyors tape and measured the roads. I am most grateful to her. It’s pretty clear from the Mayor’s answers below that TfL admits that the York Way/Pentonville Road/Grays Inn Road junction does not comply with their own safety standards for cyclists. They also refuse to say why they did not act to make the junction compliant earlier. These standard have been around for over 5 years and TfL has done nothing to make the junction comply. TfL also seems to be on the run on its ‘review’ of junctions, eliding work on the blue lane superhighways with ‘other major junctions on the TLRN where work is planned’. So in TfL’s own words if no work is planned on your local junction and it isn’t compliant with TfL’s cycle design standards then it’s just going to stay that way. Does the York Way/Pentonville Road/Grays Inn Road junction comply with TfL’s 2005 London Cycling Design Standards with regards to lane and carriageway width? The London Cycling Design Standards 2005 (LCDS) is a best practice guidance document intended to ensure that consistently high standards are applied to new schemes in order to reduce barriers to cycling. The existing junction layout at Kings Cross was implemented some time before this best practice guidance was published. The design for the imminent pedestrian and cycle improvements at the junction did use the 2005 LCDS Guidance. • more space and comfort for pedestrians when waiting at and crossing the junction. This work will be completed before the 2012 Games, which are expected to bring a large number of additional pedestrians to the Kings Cross area. TfL will include the junction within its review of cycle safety at planned TLRN major junctions with a view to making further changes after the Games if appropriate. TfL has also commenced a wider ranging strategic review of the Kings Cross Gyratory System. If the junction at York Way/Pentonville Road/Grays Inn Road does not comply with TfL’s standards when did you first become aware of this fact? Please refer to my answer to MQ 313/2012. 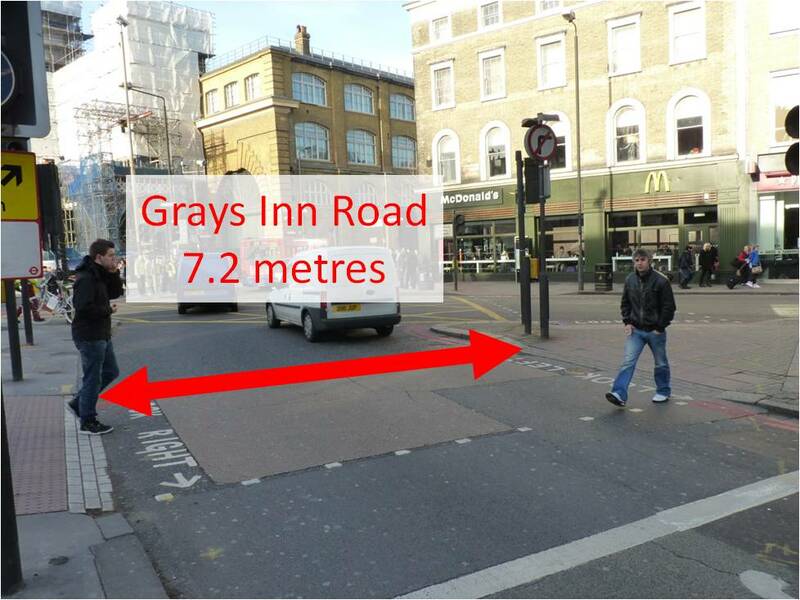 If the junction at York Way/Pentonville Road/Grays Inn Road does not comply with TfL’s standards please explain why TfL has failed to act to make the junction compliant with its own standards? Please explain what correspondence TfL has had with the Metropolitan Police about the compliance of this junction at York Way/Pentonville Road/Grays Inn Road? I believe that you are referring to compliance with the London Cycling Design Standards 2005. TfL discussed the forthcoming pedestrian improvement scheme with the Metropolitan Police Service (MPS) as part of its standard design process. Following discussions with the MPS, TfL adapted the designs for the planned pedestrian scheme in order to create some additional space for cyclists and other traffic travelling north from Grays Inn Road into York Way. There has been no correspondence with the MPS regarding compliance with the London Cycling Design Standards. Please explain if there are other junctions on the TfL road network that are not compliant with TfL’s own standards and when they will be rectified? I believe that you are referring to the London Cycling Design Standards 2005 (LCDS). The LCDS is a best practice guidance document intended to ensure that consistently high standards are applied to new schemes in order to reduce barriers to cycling. TfL develops its schemes with reference to this guidance and always endeavours to provide the best possible cycling facilities within the constraints of the given location. As you may be aware, TfL is undertaking a review of cycle safety at all junctions on the Barclays Cycle Superhighways implemented to date and at other major junctions on the TLRN where work is planned. More information on this review will be available soon.